Ah, the celebrity culture! We simply can’t get enough of the lifestyles of the famous — whether or not they’re rich, though generally they appear to have abundant amounts of cash and really interesting lives. 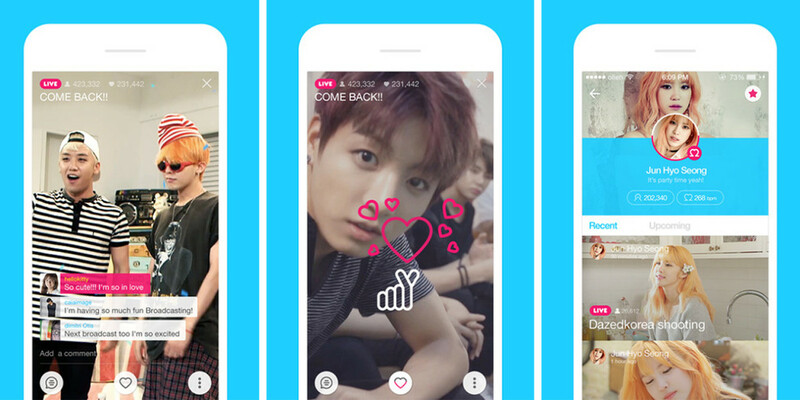 Naver, the social network behind the Line messaging app, has launched its own celeb live video broadcaster called V, joining Facebook Mentions‘ new Live feature. V lets you watch personal videos of your favorite famous folk on your phone. You can follow people, watch their videos and use comments and hearts let others know how you feel. A Popular tab — one that displays many hearts — shows you the most popular videos on the service. Videos containing lots of hearts automatically show up in the Popular screen. But there’s more to it than mere voyeurism. Watching the videos affects your so-called Chemi-beat for a celeb and Line plans to provide benefits to avid watchers. While shows will be scheduled and listed on V before airing, celebs — being who they are — can choose to broadcast at any time without prior notice. Meanwhile, a Chemi-beat — short for “chemistry beat” — expresses a “relationship index” between you and your celeb. Following and watching celeb videos boosts your Chemi-beat and rewards will follow, Naver says. While the app appears to be focused on Japan and South Korea for the moment, it is currently available in the US App Store and Google Play store. The US stores say the V app is currently in beta, with broadcasting service scheduled to begin in September. Meantime, you can still check it out.